The packaging of this Rimmel London Lasting Finish Lipstick is default lipstick package and the cap i slightly slant with a royal crown symbol which looks something different. The shade is names as Fudge Brownie which is sounds like a smack for me, the shade is brown with coppery shimmers in it which gives a metallic look. Golden shimmers in brown shade totally looks gorgeous. 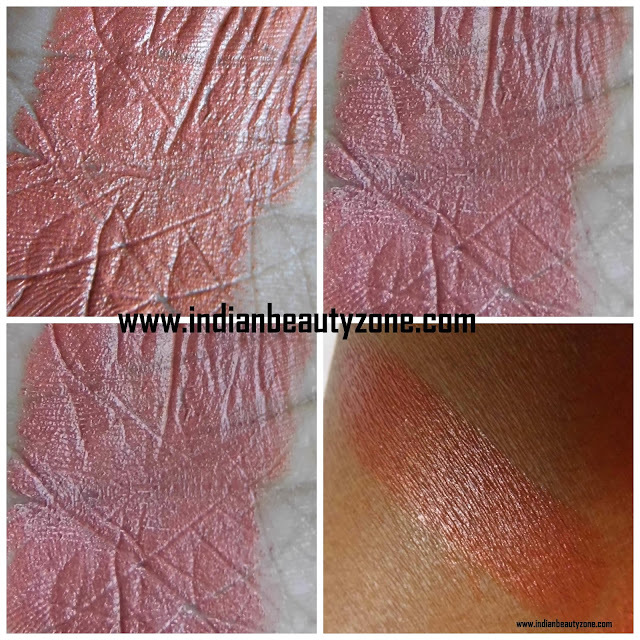 It is very pigmented lipstick which can hide any kind of pigmented lips. The texture is very soft enough to apply on the lips without tugging the lips. The smell is something different and good only, not an annoying smell. Usually I won't wear shimmer lipsticks, as they tend to create a frosty look on my pigmented lips. But, this shade looks nice on my lips. Because, this shade is brown and the shimmers are golden. The brown neutralizing my pigmentation as it gives a neutral look for my lips and the golden shimmers gives a shiny look which makes the shade totally gorgeous. I love to wear this lipstick during evening and night times as it has shimmers, I personally feel it will not look good at day time. This shade is perfect for party wears. This shade won't go good with western outfit, I think. This lipstick pigmentation hides my lips pigmentation very well and gives a neutralized shiny look which I am totally loving. This is a great lipstick for it's price, I am planning to get some more shades as I got attracted by it's quality. It stays on my lips upto 3 to 4 hours and for my normal lips I don't need any lip balm when I wear this lipstick, since it moisturize the lips well. But after fading it leaves no tint or any colour on the lips. The cap is tight enough to carry with us without making the lipstick messy around the tube. 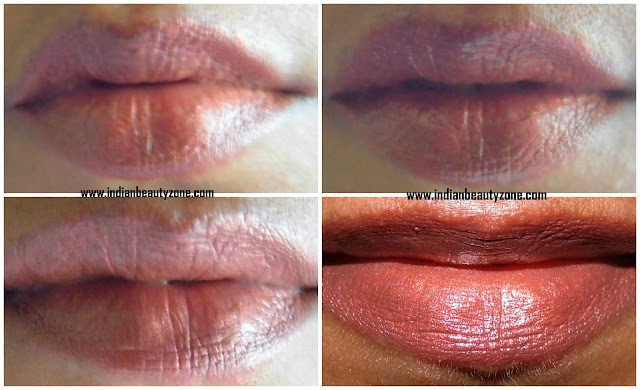 Gives a neutralized shiny look for the lips. No bleeding on the corners of lips. This shade may wash out very dark skin tone girls. Not lasting finish as they claim stays for just 4 hours maximum. Rimmel London Lasting Finish Lipstick 242 Fudge Brownie shade is very suitable for all skin tones expect very dark skin tone. They have great shade collections and I can say it is an awesome lipstick for the price.